There are 22 Assisted Living Facilities in the Franklin area, with 9 in Franklin and 13 nearby. The average cost of assisted living in Franklin is $3,698 per month. This is higher than the national median of $3,346. Cheaper nearby regions include Brentwood with an average starting cost of $3,541. To help you with your search, browse the 164 reviews below for assisted living facilities in Franklin. On average, consumers rate assisted living in Franklin 4.1 out of 5 stars. Better rated regions include Brentwood with an average rating of 4.4 out of 5 stars. Caring.com has helped 9 families in Franklin find high-quality senior care. To speak with one of our Family Advisors about assisted living options and costs in Franklin, call (855) 863-8283. Situated just 21 miles south of Nashville, Franklin offers both old-school charm and big-city amenities, giving seniors a small-town atmosphere and access to a booming metropolis. Franklin is home to some 78,321 people, and just under 12 percent of those locals are aged 65 years or older. Those seniors have a wealth of options when considering long-term residential care; there are 27 assisted living facilities in and around Franklin, including nine in Franklin proper. Those facilities are licensed and overseen by the Department of Health’s Board for Licensing Health Care Facilities, which monitors and regulates all assisted care living facilities (ACLF) in the state. Seniors on a budget might find their dollar doesn’t go quite as far in Franklin, where the cost of living index is 132, almost one-third higher than the national average. Franklin is a very safe place to live. While the national average for violent crime is 31.1 out of 100 and the average for property crime nationwide sits at 38.1, those rates in Franklin are just 12.5 and 25.5 respectively. Seniors can catch a ride courtesy of Franklin Transit, a daytime service that runs throughout the city and includes both fixed routes and pre-arranged, curb-to-curb service. Seniors are eligible for half of the regular adult fare. Senior Ride Nashville also offers transportation to medical appointments and for other errands. Wet, hot summers and mild winters are the norm in Franklin, where the climate is best suited to seniors who don’t mind humidity and rain. The Franklin area is home to world-class medical facilities, including Williamson Medical Center and Vanderbilt University Medical Center, in the event of medical emergencies or illness. Franklin has an array of community resources for seniors, including the Williamson County Parks & Recreation’s Senior Division, which offers a range of ongoing activities, discussions and tours, as well as several senior centers. Assisted Living costs in Franklin start around $3,694 per month on average, while the nationwide average cost of assisted living is $4,000 per month, according to the latest figures from Genworth’s Cost of Care Survey. 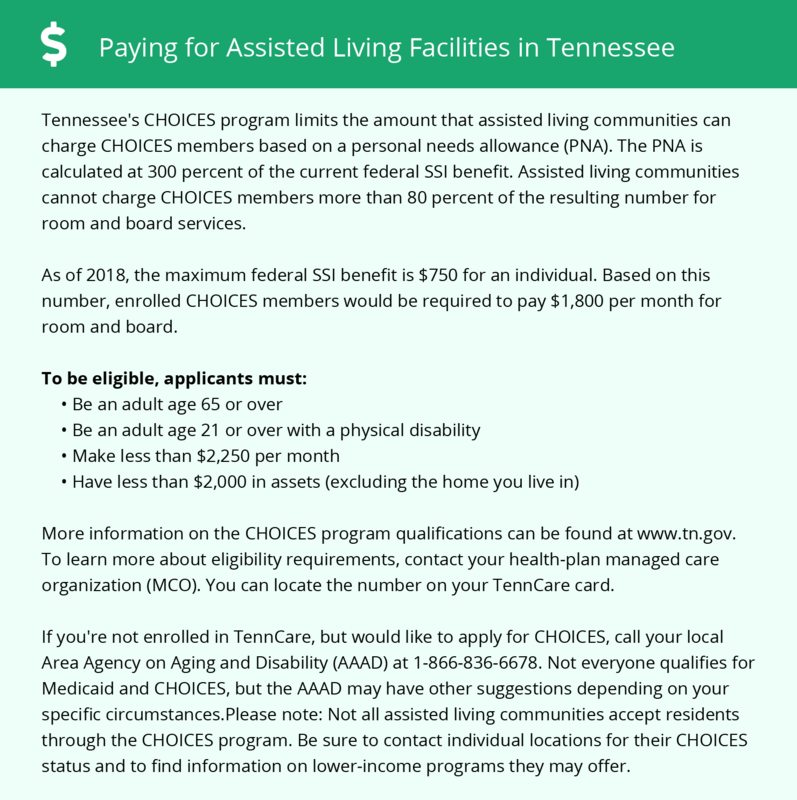 Tennessee offers several programs for seniors that are design for those who plan to live at home or in a nursing home, however, the CHOICES program is designed to fund whichever Home and Community-Based Services (HCBS) each senior prefers, including assisted living. To see a list of free assisted living resources in Franklin, please visit our Assisted Living in Tennessee page. Franklin-area assisted living communities must adhere to the comprehensive set of state laws and regulations that all assisted living communities in Tennessee are required to follow. Visit our Assisted Living in Tennessee page for more information about these laws.